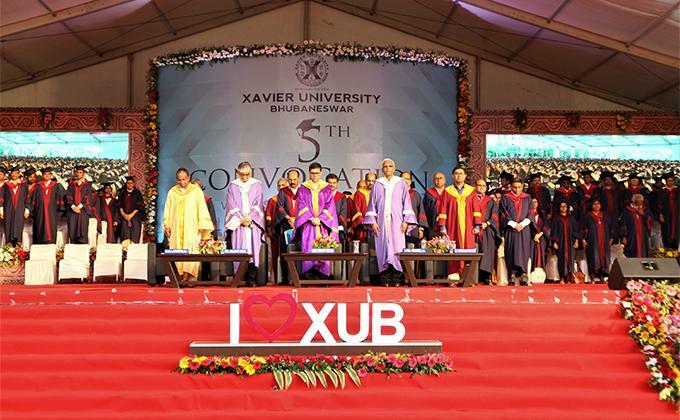 Xavier University hosted its 5th Annual Convocation at 5.00 p.m. on the 27th of March 2019, at the Xavier City Campus, Bhubaneswar. This was the first ever convocation for the Post-Graduate students at Xavier University Bhubaneswar campus at Nijigada Kurki. A total of 688 students consisting from Doctoral program, Global MBA, Business Management, Executive MBA, Human Resource Management, Rural Management, Sustainability Management, Mass Communication, Urban Management and Governance, Masters in Business Finance graduated on this historic occasion. The 2019 graduates have strived to evolve into good corporate citizens of today’s talent landscape and the convocation was an opportunity for the University to celebrate their achievements before bidding them good luck, to the ever dynamic, business world of today. Shri. Sanjiv Mehta, the Chairman and Managing Director at Hindustan Unilever Limited, Executive Vice President, Unilever South Asia graced the convocation as Chief Guest and Convocation Speaker. Mr. Mehta was recognized as “The Outstanding CEO” and “Management Man of the Year” in 2016 and 2017 respectively and in 2018; the Institute of Chartered Accountants of India recognised with the Business Leader award .On this grand occasion, Xavier University Bhubaneswar conferred an Honorary Doctoral degree in Business Management on Mr. Mehta.